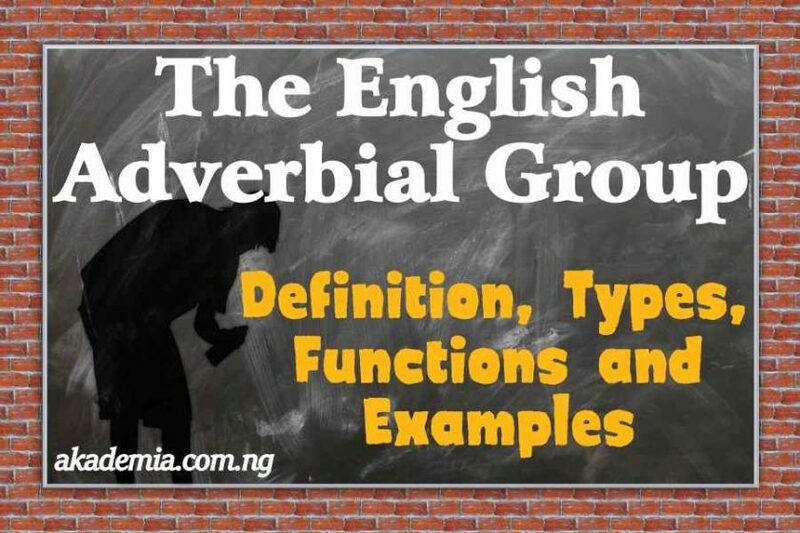 This post discusses The English Adverbial Group: Types, Functions and Examples. An adverbial group performs the same function as an adverb in a sentence. It usually expresses the contingent details about the verbal group such as time, place, manner, etc. The headword in an adverbial group is an adverb and it has other elements that modifier or qualifiers it. The adverbial group has its location under the adjunct. They were playing under the apple tree. My brother lives in Lagos. The car turned suddenly into the road. He dropped the bottle on my table. I ate the cake in the fridge. His shot went over the bar. Her skirt was above the knees. A Knickerbocker is usually below the knees. His house is built on the hill. When an adverbial element comes before the prepend, we refer to such as ‘before preposition’ element; that is (b) (p) (c). E. g.
She slapped him right in the face. He got to the airport just in time. The shot went quite off the target. I scored well­ above the pass mark. The dictation is far above the pupil’s comprehension. This adverbial group has a traditional adverb as the headword. In this sense, we refer to the headword that is an adverb as the apex. There could be adverbial modifiers or qualifiers depending on the sentence in consideration. The structure of the adverb-headed adverbial group is (t), a, (l); where ‘t’ stands for ‘temperer’, a represents ‘apex’ and ‘l’ stands for the limiter. Note that both ‘temperer’ and ‘limiter’ are optional just like the modifier and qualifier in the nominal group are. The obligatory element in the adverb-headed adverbial group is the ‘apex’. Let us see some sentences to demonstrate this. Yam is abysmally cheap in the state. Disapprovingly, he got the visa at the Embassy. She ran quite very fast. He deserves the award indeed. They really lived up to their parents’ expectations. The boys ate rather gluttonously. The then President of Uganda was a dictator. Our way there was clumsy. Nobody cares about the refugees until recently. She returned from overseas last year. We do not know her whereabouts for now. He has to wait till then. They could not leave the town since then. There are other groups in English which I have explained in other posts. See Nominal group and Verbal Group. Share these educative posts with your friends. Thank you. Do not forget to drop your comments. I love your posts, they are quite detailed. Thanks for posting.